All are welcome to attend a Catholic Mass on the day that Fr. Roy Bourgeois' excommunication takes effect. for all our prophets who stand for justice and equality in our church and our world including Fr. Roy. Fr. Roy Bourgeois is the founder of the School of the Americas Watch. Janice, a former SOA Watch Prisoner of Conscience and RCWP, will celebrate Eucharist on Friday, November 21st at 6 p.m. in the Carter Room at the Howard Johnson Motel, 1011 Veterans Parkway in Columbus, GA. The celebration and call to justice is sponsored by the Progressive Catholic Coalition and includes Call to Action, CITI-rent-a-priest, CORPUS-usa, Federation of Christian Ministries, New Ways Ministry, Roll Away the Stone, Women's Ordination Conference and Roman Catholic Womenpriests. Music will be provided by Charlie King and Karen Brandow. On the feast day of the Presentation of Mary, Janice's homily will focus on the gift of prophecy. Priest facing excommunication will fly to Rome to make his case . Enjoy. Feel free to download this video on Roman Catholic Womenpriests Overview 2002-2008 which includes Fr. 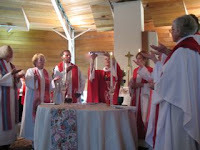 Roy Bourgeois' homily at Janice Sevre-Duszynska's ordination as a Roman Catholic Womanpriest in Lexington, Kentucky. Link to it as you wish, download as you wish. Our GodTalk non-profit just produced and edited for television and the internet Roman Catholic Womenpriests: Overview 2002-2008 which will air In N.Virginia on our public tv station in Dec. 2008. In this program, we present an overview of our history, (including the fact that our womenbishops were ordained by male bishops in good standing with the pope) the growth of the movement especially in the United States, Fr. Roy' Bourgeois's homily supporting women priests and a commentary on excommunication in the light of St.J oan of Arc, Mary Ward, St. Mother Theodore Guerin and Blessed Mother Mary Killop, all canonized in later centuries after having suffered condemnation and /or excommunication by the hierarchy. Very timely in light of the events that are now breaking with our Maryknoll supporter, Fr. Roy Bourgeois! It is available as a resource on dvd. If you are interested, contact me by email at sofiabmm@aol.com . It could be used with groups and people who are new to Roman Catholic Womenpriests and want some historical background as well as to see photos of some of the women and (men) who are serving the Roman Catholic Church and creating a renewed Roman Catholic Church right now in our midst in grassroots communities with the enthusiastic support of the people. It is available to everyone anywhere on google! Here is the link. Please share it with your communities. Enjoy. Feel free to download it and link it anywhere you wish. I was very saddened by your letter dated October 21, 2008, giving me 30 days to recant my belief and public statements that support the ordination of women in our Church, or I will be excommunicated. I have been a Catholic priest for 36 years and have a deep love for my Church and ministry. When I was a young man in the military, I felt God was calling me to the priesthood. I entered Maryknoll and was ordained in 1972. 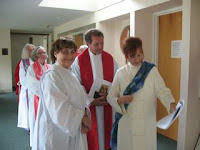 Over the years I have met a number of women in our Church who, like me, feel called by God to the priesthood. You, our Church leaders at the Vatican, tell us that women cannot be ordained. With all due respect, I believe our Catholic Church’s teaching on this issue is wrong and does not stand up to scrutiny. A 1976 report by the Pontifical Biblical Commission supports the research of Scripture scholars, canon lawyers and many faithful Catholics who have studied and pondered the Scriptures and have concluded that there is no justification in the Bible for excluding women from the priesthood. As people of faith, we profess that the invitation to the ministry of priesthood comes from God. We profess that God is the Source of life and created men and women of equal stature and dignity. The current Catholic Church doctrine on the ordination of women implies our loving and all-powerful God, Creator of heaven and earth, somehow cannot empower a woman to be a priest. Women in our Church are telling us that God is calling them to the priesthood. Who are we, as men, to say to women, “Our call is valid, but yours is not.” Who are we to tamper with God’s call? Sexism, like racism, is a sin. And no matter how hard or how long we may try to justify discrimination, in the end, it is always immoral. Hundreds of Catholic churches in the U.S. are closing because of a shortage of priests. Yet there are hundreds of committed and prophetic women telling us that God is calling them to serve our Church as priests. If we are to have a vibrant, healthy Church rooted in the teachings of our Savior, we need the faith, wisdom, experience, compassion and courage of women in the priesthood. Conscience is very sacred. Conscience gives us a sense of right and wrong and urges us to do the right thing. Conscience is what compelled Franz Jagerstatter, a humble Austrian farmer, husband and father of four young children, to refuse to join Hitler’s army, which led to his execution. Conscience is what compelled Rosa Parks to say she could no longer sit in the back of the bus. Conscience is what compels women in our Church to say they cannot be silent and deny their call from God to the priesthood. Conscience is what compelled my dear mother and father, now 95, to always strive to do the right things as faithful Catholics raising four children. And after much prayer, reflection and discernment, it is my conscience that compels me to do the right thing. I cannot recant my belief and public statements that support the ordination of women in our Church. Working and struggling for peace and justice are an integral part of our faith. For this reason, I speak out against the war in Iraq. And for the last eighteen years, I have been speaking out against the atrocities and suffering caused by the School of the Americas (SOA). Eight years ago, while in Rome for a conference on peace and justice, I was invited to speak about the SOA on Vatican Radio. During the interview, I stated that I could not address the injustice of the SOA and remain silent about injustice in my Church. I ended the interview by saying, “There will never be justice in the Catholic Church until women can be ordained.” I remain committed to this belief today. Having an all male clergy implies that men are worthy to be Catholic priests, but women are not. According to USA TODAY (Feb. 28, 2008) in the United States alone, nearly 5,000 Catholic priests have sexually abused more than 12,000 children. Many bishops, aware of the abuse, remained silent. These priests and bishops were not excommunicated. Yet the women in our Church who are called by God and are ordained to serve God’s people, and the priests and bishops who support them, are excommunicated. Silence is the voice of complicity. Therefore, I call on all Catholics, fellow priests, bishops, Pope Benedict XVI and all Church leaders at the Vatican, to speak loudly on this grave injustice of excluding women from the priesthood. Our loving God has given us a voice. Let us speak clearly and boldly and walk in solidarity as Jesus would, with the women in our Church who are being called by God to the priesthood. On October 21, 2008, the Vatican sent a letter to the Maryknoll community stating that Fr. Roy Bourgeois, a Maryknoll priest of 36 years, has 30 days to recant his statement of public support of women's ordination or he will be automatically excommunicated. Fr. 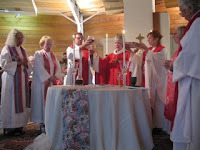 Bourgeois co-presided and gave the homily during the ordination ceremony of Roman Catholic Womenpriest, Janice Sevre-Duszynska, which took place on August 9 in Lexington, Ky. The Women's Ordination Conference has initiated a petition, with Roman Catholics Womenpriests and Call to Action as partners, to support Fr. Bourgeois. The petition will be sent to Pope Benedict XVI; the Congregation for the Doctrine of the Faith; Apostolic Nuncio to the U.S., Archbishop Pietro Sambi; and Maryknoll Superior General, John Sivalon. Please forward the petition link to your friends. In addition, we encourage you to send letters to the editor and op eds to your local papers. Some have asked for addresses to write their support of Fr. Roy and to ask that he not be excommunicated. Petitions are also appropriate. Please write or fax or email to Pope Benedict XVI, and/or the Pope’s Ambassador to the U.S., the Apostolic Nuncio, and/or the Congregation for Doctrine of Faith, the group that is moving toward excommunication of Fr. Roy Bourgeois, and/or The leaders of the Maryknoll Order. Their addresses are below. Pietro Sambi, Apostolic Nuncio3339 Massachusetts Avenue, N.W, Washington, DC, 20008-3610). Roman Catholic Womenpriests stand in solidarity with Maryknoll priest Roy Bourgeois who has been threatened by the Vatican for participating in the ordination Mass of Janice Sevre-Duszynska on August 9th in Lexington, KY, and for giving a homily in support of of women priests. We condemn this action by the Vatican as a blatant abuse of power. We thank Rev. Roy Bourgeois for his prophetic action and urge our fellow priests and bishops to follow his lead and to participate in future ordinations of Roman Catholic Womenpriests. We reaffirm that Christ calls us to liberation, not fear of Vatican reprisals. Therefore, at this sacred moment, we ask priests and members of religious communities to end their silence by speaking truth to power in support of Fr. Roy and women priests. Sign the statement/petition that Women's Ordination Conference and Call to Action are circulating. For 36 years Fr. Roy, 69, has been a Maryknoll Missionary priest. Members of this community are known worldwide for their work with those who suffer and for identifying root causes of social, economic, structural or systemic injustice. Vietnam veteran, Purple Heart recipient and torture survivor, Fr. Roy is the founder of the School of the Americas Watch, the group which protests the training of Latin American soldiers at the U.S. Army School of the Americas. "The SOA is about men in Latin America who abuse their power in order to control the lives of others," said Fr. Roy in his homily at the ordination Mass in Lexington. "They cause people to suffer and are seen as bullies." Each year in November, the weekend before Thanksgiving, tens of thousands of peacemakers gather at Ft. Benning, Georgia to speak out for justice and to take a stand against the SOA and the foreign policy that this shameful institution represents. Said Fr. Roy in his homily: "Just as soldiers in Latin America abuse their power and control others, it saddens me to see the hierarchy of our church abusing their power and causing so much suffering among women. Jesus was a healer, a peacemaker, who called everyone into the circle as equals." --Why do you excommunicate women who honor their call to the priesthood, and, in the case of Fr. Roy, the men who support them, but not the priests and bishops who have perpetrated sexual abuse of children? --Why do you continue to deny the documented archaeological evidence that supports the spiritual leadership of women as deaconesses, priests and bishops for the first 1200 years of Church history? --Why do you blaspheme Jesus, who treated women as disciples and equals? --Why do you continue to value Canon Law over the Spirit's sign of the times? --Why are you afraid to dialogue with us? Roman Catholic Womenpriests walk in solidarity with Fr. Roy, with Mary of Magdala, the Samaritan woman, Phoebe the deacon, Prisca and Aquila, Priscilla, Bishops Theodora and Brigit and the men and women disiciples of Jesus throughout the ages. Roman Catholic Womenpriests walk in solidarity with Joan of Arc who was executed with the approval of the Church, and centuries later canonized a saint. Roman Catholic Womenpriests walk in solidarity with all who disobey an unjust law. As St. Augustine taught us: “An unjust law is no law at all." -- recognize the connections between sexism and violence, sexism and racism, sexism and militarism, and sexism and nationalism. -- make the connections between lack of feminine images of God and women's suffering in the world. -- resist the abuse of power by the Vatican by taking a stand for justice (i.e., withdrawing financial support of the Church). -- empower themselves by organizing to restructure the Church. Roman Catholic Womenpriests is committed to a grassroots discipleship of equals where all are welcome at the table. Roman Catholic Womenpriests stands in solidarity with Maryknoll priest Roy Bourgeois who has been threatened by the Vatican for participating in the ordination Mass of Janice Sevre-Duszynska on August 9th in Lexington, KY, and for giving a homily in support of of women priests. We condemn this action by the Vatican as a blatant abuse of power. We thank Rev. Roy Bourgeois for his prophetic action and urge our fellow priests and bishops to follow his lead and to participate in future ordinations of Roman Catholic Womenpriests. We reaffirm that Christ calls us to liberation, not fear of Vatican reprisals. Therefore, at this sacred moment, we ask priests and members of religious communities to end their silence by speaking truth to power in support of Fr. Roy and women priests. Sign the statement/petition that Women's Ordination Conference and Call to Action are circulating.